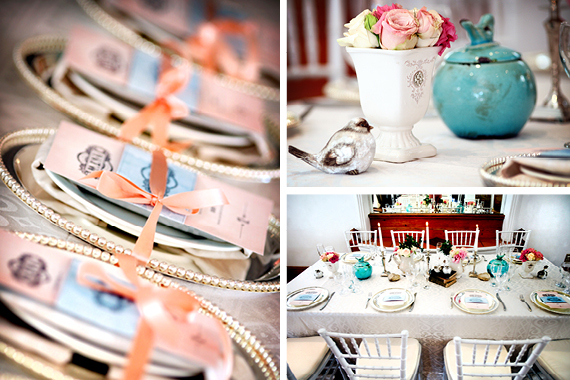 Eve from Splendid Affairs has teamed up with Amanda & Rudolfo from Custo and Chrystalace Wedding Stationery, for an exciting style shoot to showcase her latest table decorations. 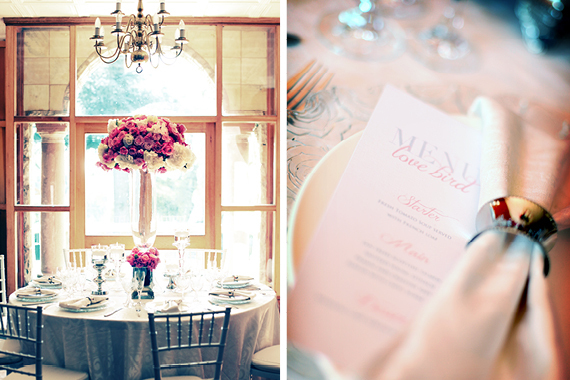 Wedding Friends is honored to have such amazing suppliers sharing their latest ideas for all to see. 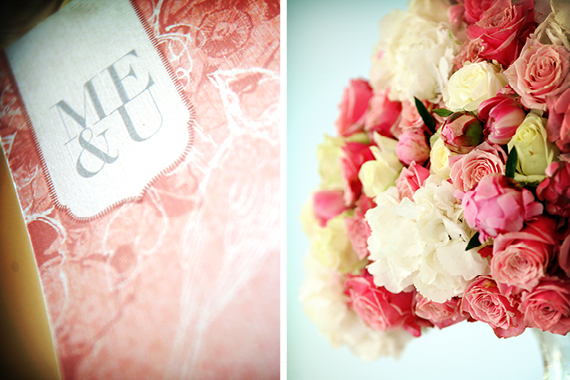 This flower arrangement and table setting is for the bride who exudes elegance, glamour and loves making a statement. There is nothing ‘simple’ about this table setting. The trend of making a bold statement with flowers is coming back and this arrangement creates a dramatic impression without being overpowering. 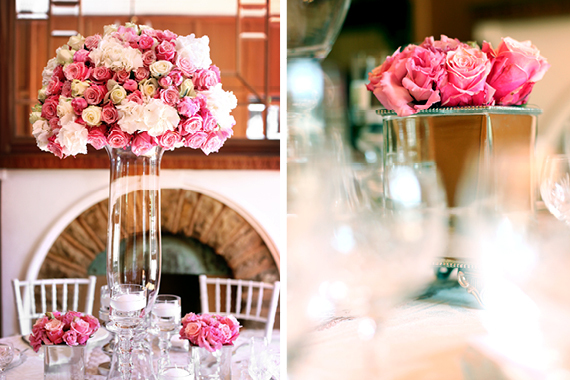 The glass vase supports a mass arrangement of gorgeous roses and hydrangea and floating candles in glass placed on silver and glass candlesticks creates a feeling of effortless glamour. 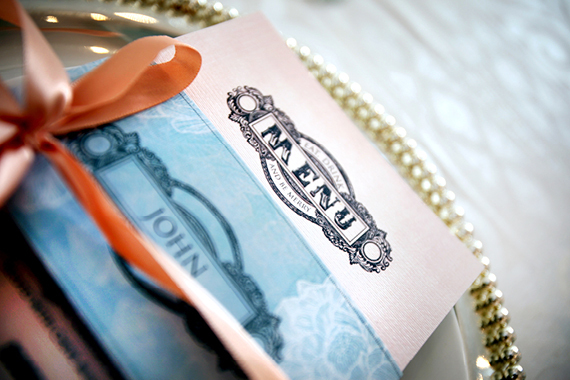 Crystal glasses, glass under-plates and tiffany chairs are all complimentary. 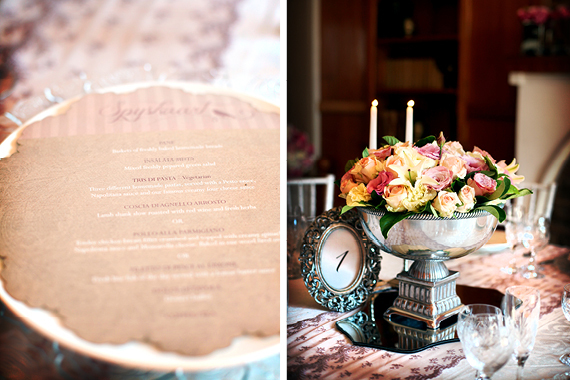 This table setting is great for late spring and summer weddings. Variations: To make this table setting even more glamorous we placed a mass arrangement in the middle of the table and layered the flowers at the bottom of trumpet glass vase. We placed chunky and floating candles in between the vases to add movement, but also to make the table setting seem effortless and fresh. 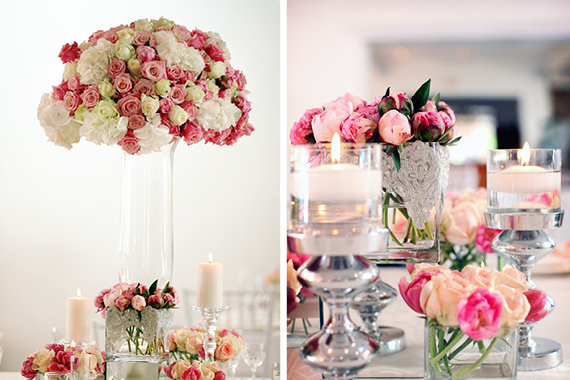 Low centerpieces are becoming increasingly popular, and so are square tables. Since square tables offer a bigger surface area, decorating a square table requires a different philosophy – balance, movement and laying is essential. 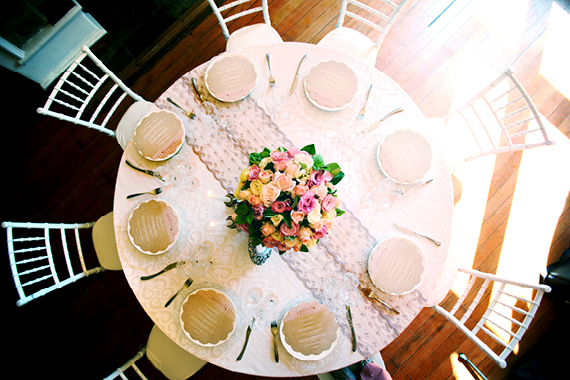 This table setting offers a sophisticated feel without being overpowering, cluttered or messy. 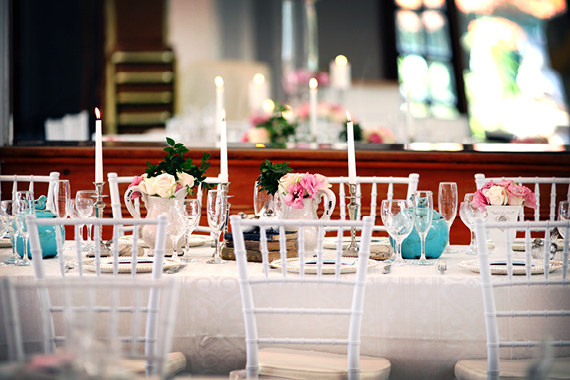 Glass containers, silver candle holders placed on different levels create understated sense of elegance. 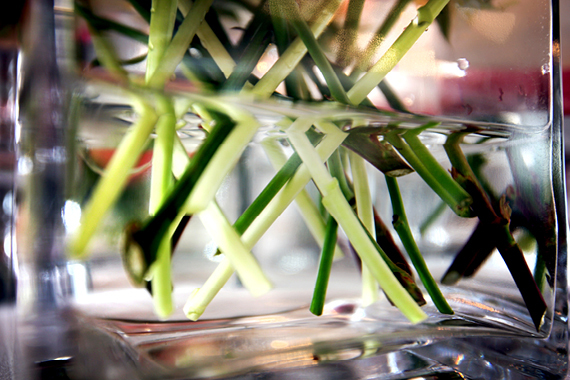 Exposed stems in the clear vase are the simplest way to create a beautiful summer/spring centerpiece. 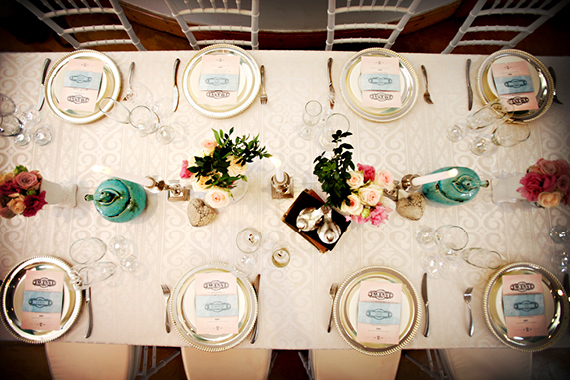 Rectangular tables are a fabulous way to set an intimate wedding atmosphere. 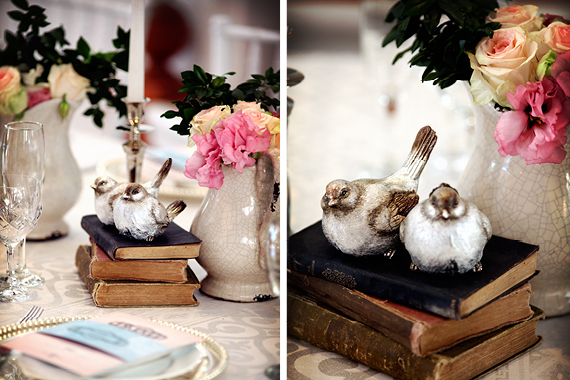 Decorating rectangular table lends itself to the vintage theme whereby using mismatched containers, vases, planters and pots with elements such as books, birds and hearts is not only fun but beautiful. 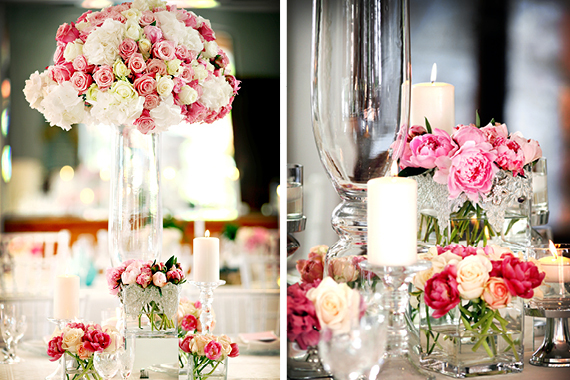 Flowers and decor work together in creating a wedding table that is elegant and simply gorgeous. Variations: Mix glass, silver and pottery together to achieve a vintage look. 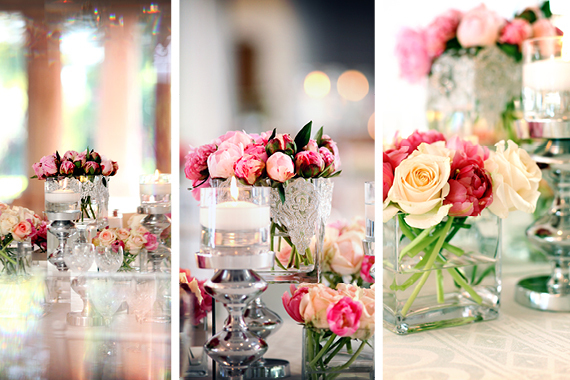 Roses always look gorgeous in pots and in crystal vases. Excellent work. Eve you just have that special touch. Hope we do a wedding together one day. Pragtig – lekker om weer blomme te sien wat sin maak! !